Our stay at BUNGALOW EL HOUDA in Hammamet for 10 days has been a very memorable one. The host Moncef is a father figure and a very gentle person. The restaurant attached to the property is expertly headed by his son Heidi - who is an accomplished chef himself. Although all essentials are available in the nearby areas, we quit on our own culirary skills & surrendered ourselves to the expertise of Heidi. The beach in very close by and indeed very clean. The property is a 10 min taxi ride to the old quarters of Hammamet - must visit only if you are interested in fine dining options with exotic views. My next visit to Tunisia is going to be based in this property and most time spent driving around the countryside with this family as our guides! This is the 4th time I have stayed here. I have recommended this to friends who have stayed and enjoyed their holiday. The owner is a lovely man, very helpful, his staff at hand if you have any queries too f he is not available. In a quiet off road position, secure and secluded. It feels very safe. 5 minute walk to beach, restaurant 1 min from your room olivio which is lovely and recently refurbished. Looking at going back in October and will continue next year too. It was in general a fantastic stay, pick-up driver/chauffeur service (offered/to be requested with fair charge) was excellent and well organised. I even asked to stopped to the shops before getting into the villa. It was clean, with basic things you need in self-catering, lots of rooms, good plenty of space. Utilities like gas and electric included (electric powered by solar panels which is great for environment). It's better if you tidy up yourself :o) Wifi was acceptably good, there is reception, restaurant as you go into the complex which makes it very secure. It seems like each building is separate so you have good privacy from next doors occupants. Very friendly and the owner, Ben Moncef Aribia really genuinely cares for his customers. Good food at the restaurant enough choices on menu for normal stuff. Good to excellent price for the accommodation. You can leave the bathroom window open, if need be/as necessary, as it has a metal grill for security that no one can come in. All in all it was excellent secure, safe, clean, and 5mins walk to the beach / beautiful seaside. We've just returned from our lovely two week honeymoon here at the El Houda Bungalows. Located in a quiet, but convenient area where you feel very safe to walk around - day or at night. The beautiful beach is only 5 minutes away (there is a small path alongside the Miramar Hotel). There are plenty of souvenier shops, and also supermarkets, butchers, fruit & veg shops all just a short stroll away, so you can get all you need if you prefer self-catering. If not, the L'Olive Restaurant - part of the El Houda complex - serves fresh, homemade food in a relaxed garden settings (depending on the season, there may be a restricted menue, but you will always find something for everyone's taste here). There are also plenty of restaurants around if you don't fancy washing up (we can recommend the Marina Perla for its fresh fish and attentive service). 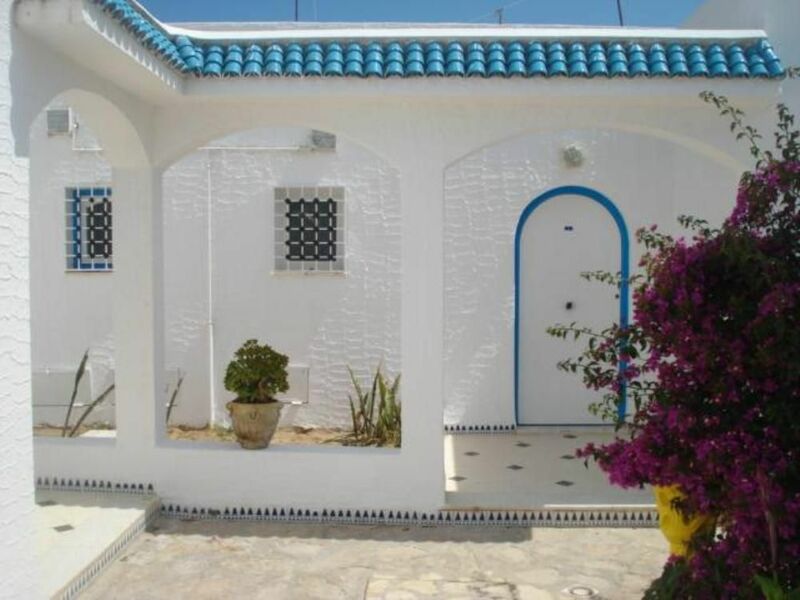 The bungalows are spacious and furnished in traditional Tunisian style. Some might find some of the kitchen utensils a bit basic and dated, but we thought it was fun to get creative and cook with what we had to hand. There are also modern items for your convenience, such as a air-conditioning (hot or cold air) coffee maschine, microwave and flat screen TV. The hot water system is powered by solar power, so nice to see that all is environmental friendly too, so you don't have to feel too guilty enjoying a long hot shower after an 'exhausting' day at the beach. Each bungalow has a patio/terrace which we enjoyed a lot to either have breakfast in the sunshine or dinner by candle light. We really enjoyed our stay here at the El Houda Bungalows as we had our own private space, but in a secure complex and all the conveniences nearby. The lovely caretaker/chef cook/manager seemed to be around 24/7 and always had a lovely smile on his face and was very helpful and hardworking to make our stay even better. We would recommend these bungalows to anyone who is looking for simple comforts in a great location, friendly, personal environment and good value for money rather than the often inpersonal luxuries you get in a 5 Star Hotel. Thank you for being so welcoming and kind. We hope to be back again sometime in the future. "beautifull bungalow-had everything i required.very clean and well presented. few cold nights made pleasant by central heating in the bungalow.fabulous terrace but sadly couldnt use much as very cold(end nov dec). friendly caretaker on site to assist with anything.good wifi in lolivio cafe which is part of site and serves lovely snacks and drinks set in garden. easy reach for beach(short walk) good access by taxi to other areas and central hammamet.recommended and will definately revisit."